You tend to know when you need a project management app. 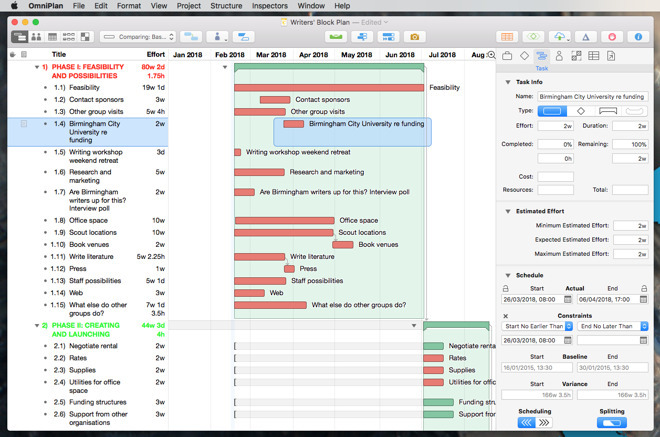 You'd be a little crazy to plan a small, intimate dinner party with a project management app but you'd be insane to build an office block without something like OmniPlan. There comes a time when even the best To Do app just can't cut it for you. It could be that you just have so very, very much that you need to get accomplished. It could be that you have to get other people to do a lot of it, or you're on a job that is complex and ever-changing. 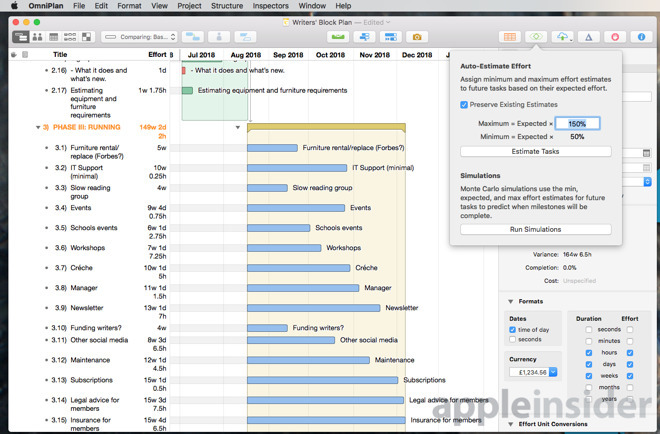 In that case, you need project management software and the newly updated OmniPlan 3.9 is the currently the best one for the Mac. Whatever you do use it for, though, there tend to be two key elements of your work that this update aims to improve. One is just that you can be juggling so much detail that keeping the big picture in view is tricky. The other is that if the work is this big and this complex it's also that expensive and you've probably got a client asking you how it's going. OmniPlan 3.9 takes two existing features, the Project Inspector and the Dashboard, and adds to them to help with both of these elements. The Project Inspector has always been a panel that includes the basic details of the job like its start date. Now, though, it adds a Summary section that presents a kind of core overview that you can rattle off to your client when he or she phones. It tells you and the client the current duration of the project plus how much that's varied since the original plan. 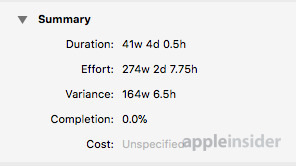 It shows you how close you are to completing in terms of the percentage of the job done. This Project Inspector addition also displays a measure of the effort that's been put into the work: that's a record of the resources like staff time when you're managing a lot of people. Depending on how you've set up OmniPlan and whether you've really packed it with every detail possible, this Project Inspector also shows you the cost of the project. That's the actual cost, in dollars and cents. As the person working in OmniPlan, you'll see that Project Inspector every time you want but you can also step further back to see the even bigger picture with Dashboard. This is an OmniPlan feature that recognizes that no matter what we tell our clients, the truth is that we're probably working on multiple projects at the same time. The Project Inspector says what's going on with the client's particular project but the Dashboard tells us everything. Say you're a freelance project manager and you're working with three clients on entirely separate projects. 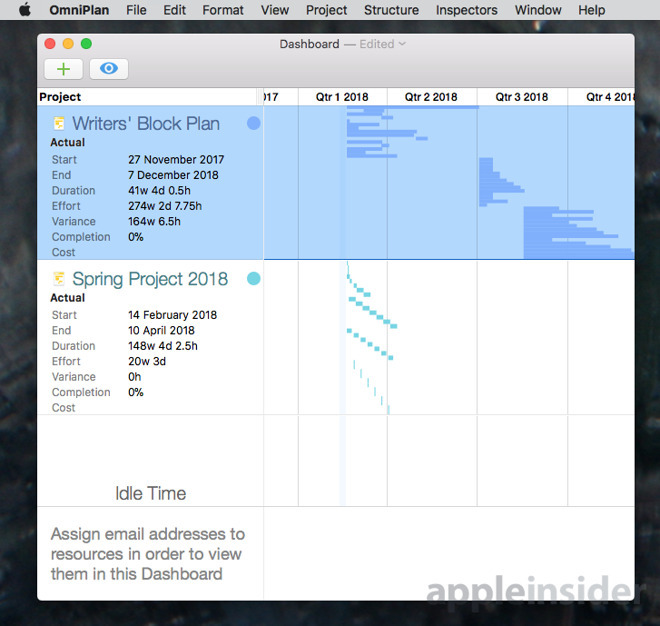 Each OmniPlan project is a document on your Mac and when you create a new Dashboard window in the app, you can drag all of those documents into it. So now you're seeing an overview of each client's project and you can see where you need to put your effort next. Unlike the Project Inspector's straight text summary, Dashboard is a visual tool and what's new is that you can drill down a little further than you could. Rather than showing you the entirety of each project, you can now tell Dashboard to show you the detail for this month or this range of weeks. All of this helps you when you are deep into a project and especially when, inevitably, something is going wrong. If you're actually on staff with a company and your many projects are all to do with them then you can use these tools to juggle your resources. OmniPlan tracks physical things like the raw materials used in construction or equipment like your office photocopiers. More usefully and actually more impressively, it also tracks what people are available to you. When you first set up the project in OmniPlan, you can tell it that you've got five engineers, two accountants and a PA. However, you can also tell it that two of those engineers are only available to you on Thursdays and Fridays. The PA starts work at 7am so that he can leave at 3pm for the school run. Or maybe the two accountants are job sharing so actually you've only got the equivalent of one. Depending on your point of view you can also be either pragmatic or cruel: you can tell OmniPlan that this engineer is only half as good as that one. Let's say the poorer engineer is just starting out while the other one has done the same project a hundred times. Whatever the reason, you can assign a measure of effort or effectiveness to a person and OmniPlan remembers all of this. So right now you're fifteen weeks into your project and things are going wrong. You're maybe three weeks behind schedule. Lots of things are going to be hitting you right now such as, say, half your engineering staff are due to move to another project. Starting with the new Dashboard and then drilling down, you can get an overview that shows you where your work is being done and where your resources like staff and equipment are not being fully used. At the heart of every project is a series of tasks and you can then drag some to the engineer who's not busy and some away from one who is. You can see that you're going to lose the photocopier next week so you drag forward everything you can that needs to destroy some trees. Since the Dashboard shows you all of your projects at the same time, you can start moving resources between them, too. If you have the Pro version of OmniPlan then you can also get it to make predictions about how the project is going to go. Change your tasks around, drag resources back and forth, share people between projects and then click to have OmniPlan run what's called a Monte Carlo Simulation. It's only a projection but it's based on factors in the plan and comes back with a decent idea of whether you're going to complete the project on time. If you are, relax a bit. If you're not, try juggling the resources around until you do. These are all features that have existed in OmniPlan for some time but are improved in this release by the refinements of the Dashboard and Project Inspector. The weakness is in how you originally enter all of the thousands of tasks you might have to do in your project. You can type one, hit Return and type the next. However, organizing them, grouping them, seeing that this series of tasks must be done before you can even think about that next set, this is all quite tough in OmniPlan. Yet it's a doddle in OmniOutliner. So open OmniOutliner, bash in every single thought you've got about the project and then take your time massaging it all into some kind of coherent shape. 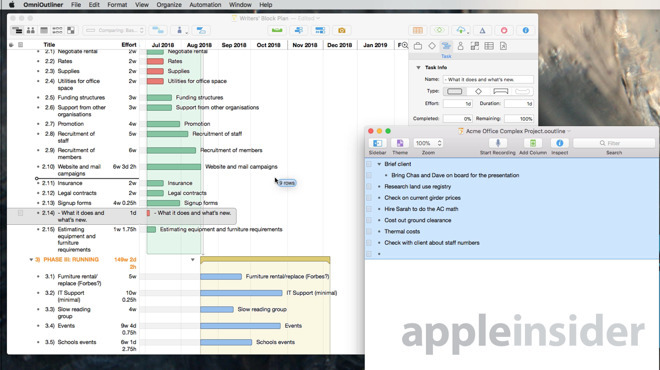 Now you can then select all of the tasks in OmniOutliner and drag them over to OmniPlan. This is now true on the iPad too as this month's update to OmniOutliner brings iOS 11's drag and drop feature. 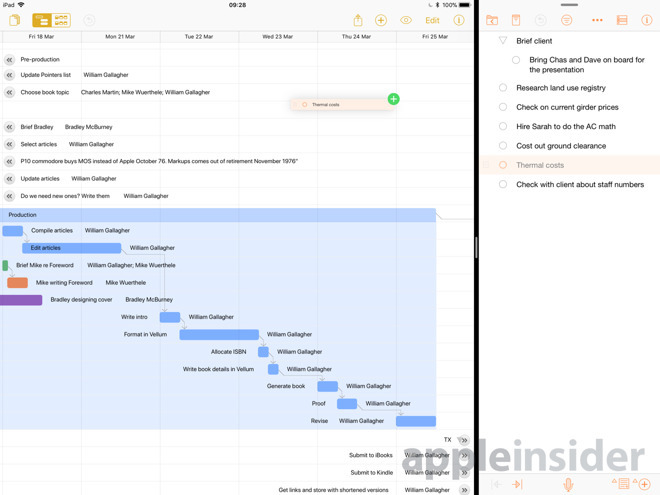 You can drag back and forth between that and OmniPlan 3.8.2 for iOS. You shouldn't need a separate app to do what could be done within OmniPlan itself and really you don't but the combination of the two is so powerful that you will. If the initial entering and then organizing of your tasks is one weakness of OmniPlan, there are others. The biggest and one that will never be fixed is that OmniPlan is not Microsoft Project. That Microsoft app is the standard for professional project managers across the world and it is very, very powerful. It's also just very, very cumbersome and Microsoft won't tell you the price so you know it's very, very expensive. Plus it's very, very absent on the Mac and iPad. If you want to use Apple gear or perhaps you don't want to have to switch to Windows just to use one tool, then OmniPlan is your best option. It will open Microsoft Project documents and it will save your work in that format too. Conversion like this is never ideal, though, and there will always be problems. 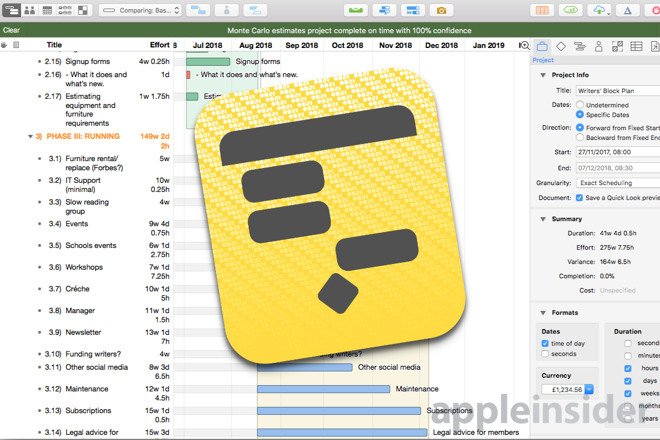 The new OmniPlan 3.9 for Mac update includes fixes for bugs in that Microsoft Project import and export but invariably you're better off staying in one app and using its one format. We'd just say that the one to use is OmniPlan. Given the work that OmniPlan is used for and given the type of job you probably have if you need project management, we'd recommend you go straight from trial to the Pro version. You'll also want the iPad edition for when you're on site or at a client's office. Remember to hide the detail about which engineer is useless. Otherwise, it's the same thing of a two-week free trial via the App Store and then a choice of $74.99 for Standard and $149.99 for Pro.